Even after having a big smartphone, this smart-phone is quite light. Although there are no additional things like pop-up cameras, due to which it is easy to use. The smartphone has a 3.5 mm headphone jack with a speaker and charging port. 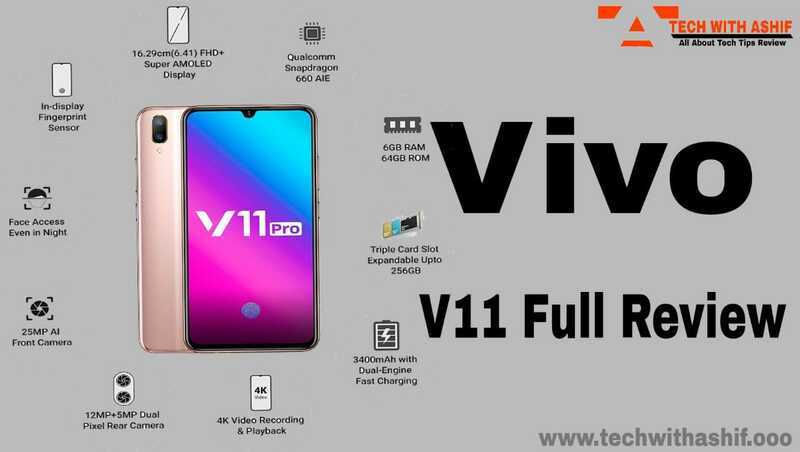 If we talk about Over All Design, Vivo has not given anything special in the Vivo V11 Pro. If you have used other models of Vivo before, it will look like yours. However, due to its gradient look and slim it will make you feel better. At the same time, talking about the rear design, it is curved on the edges. There will also be a possibility of scratching on its body on daily use, but Viveo is giving you a transparent cover to avoid this. The biggest drawback in its design is that V11 Pro is not water and dust proof. Talking about the display, the V11 Pro has a super display display with a Super Amoled screen, which is also good looking wiz. The V11 Pro has a 6.4-inch Halo full view display 3.0 with a resolution of 2340X1080 pixels with 19.5: 9 aspect ratios, which Vivo has named FHD +. There is also a 2.5D glass, because of which you can also say that this smartphone is made for PUBG. If you talk about color, its display is good. Ambient light sensor and proximity sensor will not be visible on your display, but if you look a little emphasis, then you will be seen on the right side of the nouch. In it you get an in-screen fingerprint display that works almost all the time. In terms of software, you will also find many display features in V11 Pro, which include Eye Protection, Color Temperature Adjustment.Apart from this, you can also adjust the aspect ratio of third party applications. Overall we can say that its display is well worth the price but not very good. Vivo V11 Pro Average smartphone with great selfie camera. Speaking of the camera, the Vivo v11 Pro camera is great. It has a dual rear camera and a single front facing camera setup. The performance of its rear camera should be good because Vivo has given all the important camera features in it. Clicking Photos in Slow Lights comes a little nause but it can be ignoredPhotographs in Daylight come as per your expectation because its autofocus is great. vivo claims that this smartphone can focus on the subject in 0.03 seconds. Taking natural shots from the 12 MP +5 MP rear camera setup will be a bit difficult, but for the result you have many options in the settings. Its shutter speed is quite good and night shots are quite clean in it. For the 12 MC sensor, it has been given an amplitude of 1.28 Um pixels with f / 1.8, which gives enough light to it.Apart from this,V11 Pro offers you many options related to camera such as AI Face Beauty, Panaroma, Professional, Dock, Video and AI Stickers. HDR and Portrait features are also available on the board. Talking about video recording, the performance of the Vivo V11 Pro is average. You can easily move it from fullHd resolution mode to HD and 480 pixels.With Video Face Beauty feature, you also get slo-mo, time lapse mode and different types of filters. Its 25 megapixel front camera also works better in Low Light. In the front camera, you can also change the aspect ratio, as well as use different filters. Talking about the overall camera,the V11 Pro camera is good and its selfie camera works very well.Vivo V11 Pro Average smartphone with great selfie camera. Overall performance of V11 Pro is fine. It does not take too much time even in booting. We have been working on the editing application for a long time in the smartphone but it has not happened once the V11 Pro has failed or lagged.One of the reasons for this is that there is a Qualcomm Snapdragon 660 proces-sor, which is very good in terms of specification of mid range set. This processor also has a 6 GB RAM touch screen. However, if you edit 4K videos full HD videos on this smartphone, its performance remains average. Apart from this, after playing PUBG continuously for 4-5 hours, there was no problem of heating in it. Most games, netflixes and other OTT apps go great on thisThat's right, if you talk about its over all user interface, that too is quite fast. Its frame OS 4.5 (Android 8.1 orio) is quite good however, in terms of gesture, it is similar to the IOS of this range. In terms of performance, you will not have to wear your fingers over its 6.4 inch screen. Speaking of batteries, the performance of the Vivo V11 Pro is very good. To maintain your top-10 rank, you can play 4-5 PUBG matches comfortably on V11 Pro. A non-removable battery of 3400 mAh is provided in V11 Pro. Normally, it can be comfortable all day while using on heavier usage it will last for half an hour. Dual engine fast charging technology has been given in VivoV11 Pro, in which, in just half an hour you can charge 60-70% of the battery. 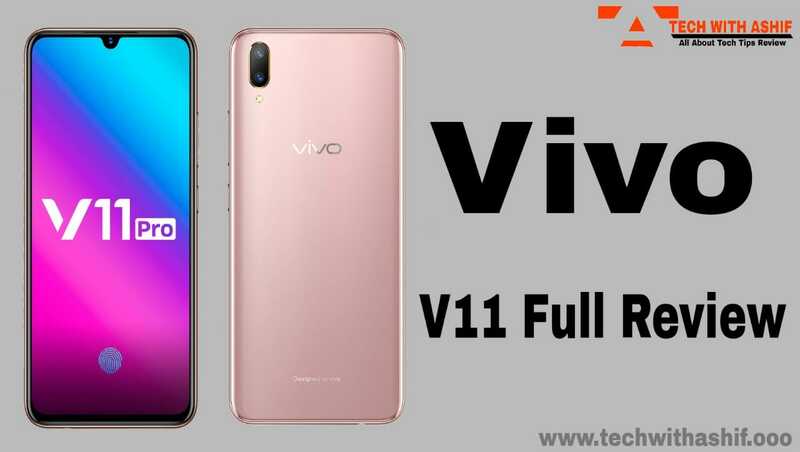 Vivo has tried to give a good smartphone in Mid-range segment via V11 Pro, in which it has also been quite successfulBut when it comes to competing companies, they have a better option in terms of specifications. Vivo V11 Pro Average smartphone with great selfie camera.The V11 Pro has a large battery, Amoled screen, great camera and good design, but if the Fantastic OS UI is dropped, then there is nothing special that you will not find in other competitive brands. In such a case, if you are going to buy a smartphone of this range, then you can also select Asus Zenfone 5Z.